What is the color of the Internet? What is the color of the Internet? This question is like "what is the weight of the oceans?". It is unanswered. First of all, Maybe we have to find the right answer for "How many websites exist? The question is difficult to answer precisely. Because the Internet is growing fast. 224,749,695 websites were indexed by Netcraft as of March 2009, in the August 2008 result was 176,748,506. 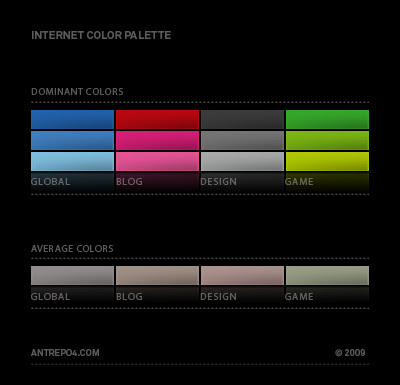 But we tried to find suitable answer about the color palette of the internet. 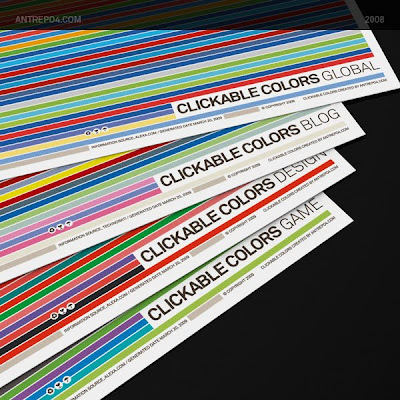 Four "Clickable Colors" posters shows, the rainbow of the Internet. 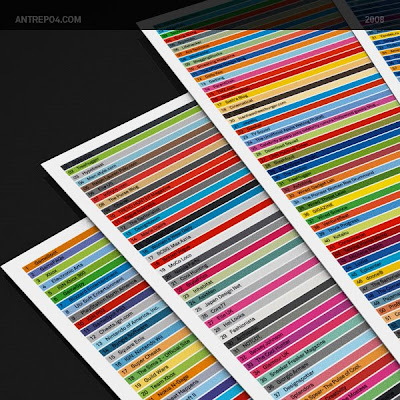 The color information comes from the top sites on the world wide web. Top list information for the categories of design, game and global are from the Alexa Web Information Service. Blog top list information is from Technorati. 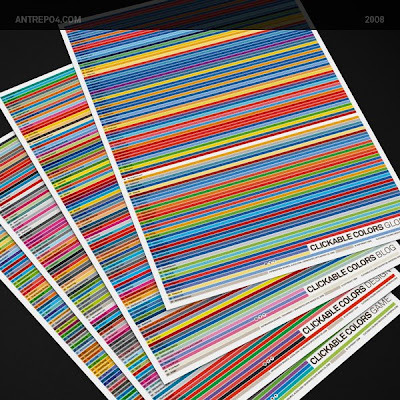 The result is quite colorful and exiting like the internet itself. Nice research! But I do wonder why the color of RED is associated with blogs, anybody has the definite answer? Red pops, that's the only explanation I have. I know that especially money-centered blogs tend to use red. I had a client years ago that told me that every blog I built for him had to have a liberal dose of red, especially in call to action areas. He said that it made people want to spend money. No idea if that is true, but apparently he really believed it. Great post, by the way. Cheers. Very interesting visualization! Can you describe how you gathered this information - was it manually, or through some kind of automated analysis of the CSS? Very nice. 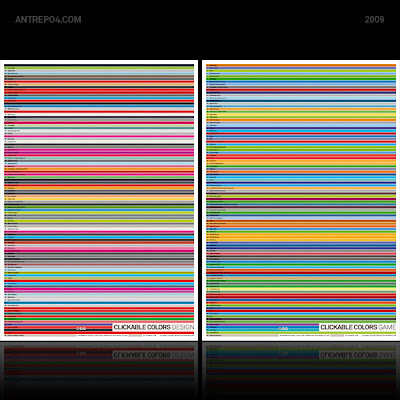 Any way you could post this as an Adobe pallet or a database of hex values? It's so sad that the dominant colors are so ugly. 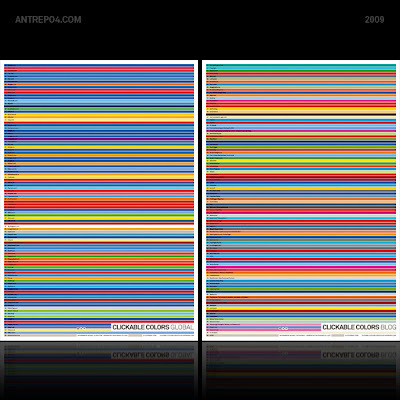 Generic blue, generic red, generic green and gray. I suppose it's not a surprise, but they seem uninspired. Last I checked, the internet was mostly 650nm red alternated with black. I believe red is one of the hardest colors to use effectively on the web, but when its done well, it looks fantastic. I found it interesting that so many blogs seem to have red - would love to know more about the research. nice job. i wanna see detail of that!!! This blog is really nice and informative. We are pleased to know this blog is really helping people. I recently came across your blog and have been reading along. I thought I would leave my first comment. I don't know what to say except that I have enjoyed. Really a nice post here! I really don't know what exactly my comment in this post. All I can say is when we about to color coding everything it will became more organize and traceable. I love the color coding. Your blog shows that you're writing with wisdom. I am pleased to say that this blog raises the belief of those reading it. Please continue the good work. I don't mind splashes of red, or a bold read heading on white background, but sites with heavy red are a bit of a turn off. please go http://www.alexa.com/topsites/category for more information. It's funny how blue is always a popular color on websites. I guess it's true about it's calming effect. Red can really draw a person's eyes to a headline. I use it often.